Character: The Malshi is a Speciality designer dog. It is a cross between the Maltese and the Shih Tzu. The Mal-Shi is a designer hybrid dog known for being hypo-allergenic and non shedding that adapts well to full-time indoor and apartment living, yet enjoys spending time outdoors, playing games, such as fetch and frisbee, and taking long and leisurely walks. More importantly they love to be a lap dog so if you want something to cuddle and love look no further Malshi is for you! Malshi is typically a fast, friendly, family focused pet with a very playful personality. They are usually easier to train, and require less attention and affection than the standard Shih Tzu but are often aloof with strangers. Early socializing with children, friends, animals and travel is recommended. Temperament: The Malshi is an intelligent, loyal, playful breed that requires moderate exercise and mental stimulation. Though quite independent, they are very eager to please and easily trained. They do well with older children, nearly all animals, and with those of whom they are accustomed. They are alert, agile and highly perceptive. They’re not overly vocal and often fearful of strangers, making them a poor candidate for watchdog. Training: A first generation Malshi is typically a highly intelligent focused dog. General speaking, in comparison to training a Shih Tzu, the Malshi is a star pupil. The Malshi is usually quite perceptive and eager to learn and comply, making them a good choice for first time dog owners or those lacking the patience and training skills required for formal housetraining. Early socializing with children, friends, animals. Care: The Malshi typically requires three or more puppy cuts (trimmed short or shaved) per year. If supporting a full coat or ‘show coat’ daily brushing and the traditional center part and top knot, like the Shih Tzu, is the most common grooming regimen. Activity: Malshi are house pets in need of protection from extreme temperatures and they require plenty of exercise and playtime. A brisk twenty minute daily walk may do the trick, but don’t neglect to fulfill their never ending desire to run, chew and play. A bored lazy Malshi is likely to become depressed, destructive, disobedient or even worse, missing. Malshipoo Malshipoo is a Specialty Designer Puppy people can’t help but fall in love with. The mixture of this breed is a Maltipoo and Shih Tzu or a Shihpoo and Maltese, so in realty your puppy is a Maltese, Shih Tzu and Poodle. Making a MalShihpoo SMART! These three favorite breeds all mixed in one makes the perfect breed. And remember Poodles are listed along with German Shepherd as being second in line as the most intelligent of dogs. 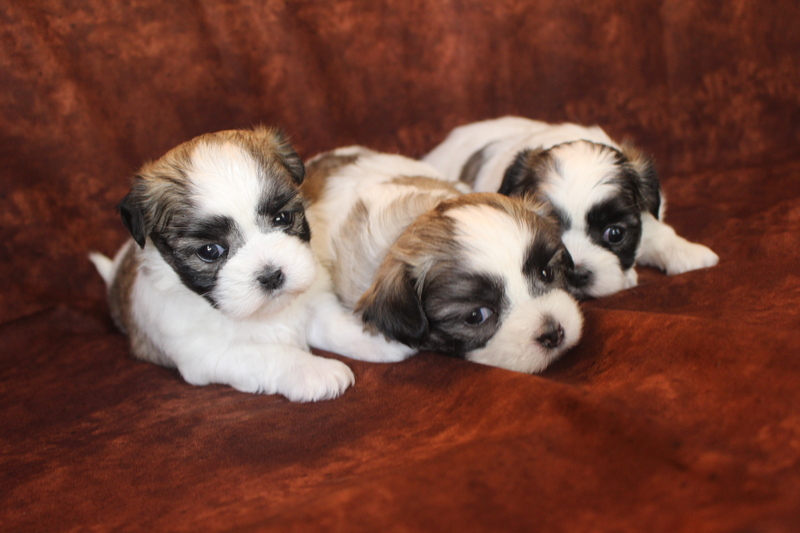 Shih Tzu are the laid back over eager to please and the Maltese is the funside of the three. They are a perfect size for apartment or condo living. Hypo-allergenic and non-shedding. More importantly they love to be a lap dog so if you want a puppy to cuddle and love look no further Malshipoo is for you! Malshipoo is typically a fast, friendly, family focused pet with a very playful personality. They are usually easier to train, and require less attention and affection than the standard Shih Tzu but are often aloof with strangers. Early socializing with children, friends, animals and travel is recommended. Temperament: The Malshipoo is an intelligent, loyal, playful breed that requires moderate exercise and mental stimulation. Though quite independent, they are very eager to please and easily trained. They do well with older children, nearly all animals, and with those of whom they are accustomed. They are alert, agile and highly perceptive. They’re not overly vocal and often fearful of strangers, making them a poor candidate for watchdog. Training: A first generation Malshipoo is typically a highly intelligent focused dog. 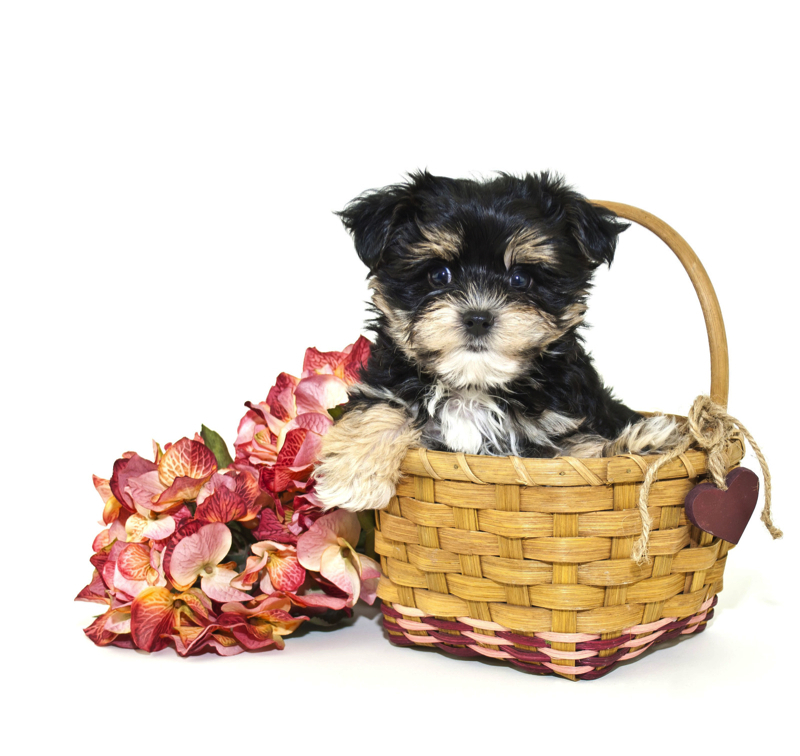 General speaking, in comparison to training a Shih Tzu, the Malshipoo is a star pupil. The Malshipoo is usually quite perceptive and eager to learn and comply, making them a good choice for first time dog owners or those lacking the patience and training skills required for formal housetraining. Early socializing with children, friends, animals and travel is recommended. Care: The Malshipoo typically requires three or more puppy cuts (trimmed short or shaved) per year. If supporting a full coat or ‘show coat’ daily brushing and the traditional center part and top knot, like the Shih Tzu, is the most common grooming regimen. Activity: Malshipoo are house pets in need of protection from extreme temperatures and they require plenty of exercise and playtime. A brisk twenty minute daily walk may do the trick, but don’t neglect to fulfill their never ending desire to run, chew and play. Do you have a female brown puppy please ? A gorgeous Yorkipoo I am taking pictures today and tomorrow and will send pics then. I’m looking for a malshi, but.m not sure how to look at yours up for adoption, as well as how much your malshis go for? I was wondering the same thing! Would love to see your Malshi’s if you have any and also wondered about price. Thank you! All available pups are on my Malshi currently available page just one extra tab. I tried sending this email below so I could attach pics but I see it cam to me so sorry no pictures attached with this server but you can see them on my website. Skylar is a beautiful first generation Havashu that is a little over 13 weeks old and as of Thursday has all her vaccines including her rabies. She weighs 4.6 lbs as of yesterday when these pics were taken making her adult weight about 8 lbs maybe a little more if too many treats or she is spayed. Attaching her pics for you. How much does a Malshipoo weigh at full grown size? I purchased a puppy but parvo positive now need available puppies to view. Hard to find breeders /puppies. Thank you in North Carolina so shipping may be needed. How long ago did your puppy have parvo? I have 3 sweet boys still available that are ready now. What do the female puppies cost. They are $1750 and they come with pre-training to know barking is rude and more. 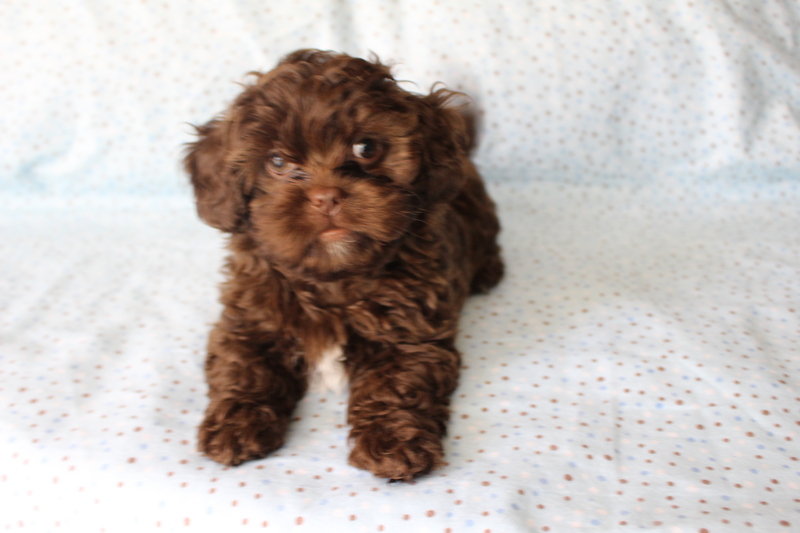 i am looking to purchase a female, chocolate, or chocolate and white malshipoo. i am looking for one that will be available in august. Sent pics from other email. how big do malshipoo’s get? hello, I was curious if your Black Malshipoo is still available? I was looking for a Yorkie Poo and was curious if you will be breeding them in the near picture. I’m interested in a female Malshipoo. Are there any available? Any updates on when Malshipoo puppy may be available? 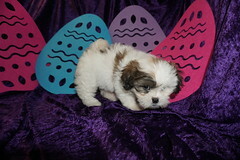 Praying for a female brown or apricot Malshipoo. Thank you Stacy. Looking forward to hearing from you. Hello I have a question please. I have a 5 month old malshipoo female and I would like to sssn upunpics to see if she looks like a true malshipoo to you. Thank you for your time. I paid $300 for her. Do you currently have any Malshipoo’s for sale? I just sold the last one in the litter on Monday. How to get price and how to adopt ? Our current Malshipoos are already claimed and we aren’t expecting another litter right now. However, this can change any day depending on when our mom comes into season.